At my first meeting with my new group, the leader demonstrated Rag Quilts. I’ve always loved the look, and I’ve heard explanations of how to do them, but none of the explanations made it sound so easy as these ones. I was excited. I went to the fabric shop and bought fabrics, as it turned out barely enough for a little 40″ x 40″ quilt. 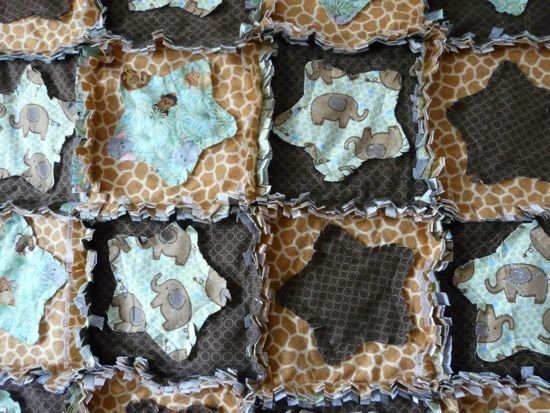 These rag quilts are easy, but fabric intensive. I did not use batting, because this is Florida, and the quilts are flannel, but I think I may do a couple with batting for colder climates – it makes great use of leftover batting. On these, I cut the squares 8.5 inches, used seams about 1″, and bought the special scissors our group leader recommended, Fons and Porter scissors specially designed for rag quilts. They are short blades, and very, very sharp. They make cutting the seams a breeze. 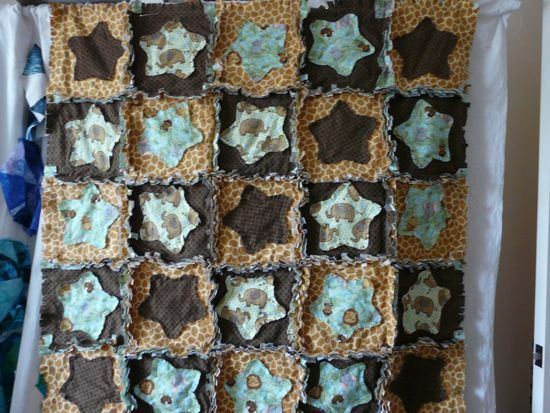 On the first quilt, the jungle quilt, I attached stars, again, very easy, as it also served as quilting, front, back and star. 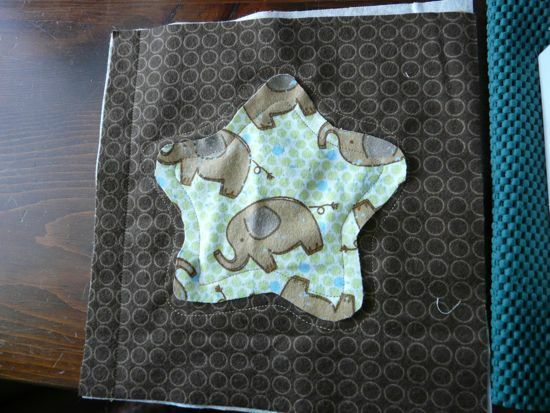 I echo quilted again once outside the star, and quilting is done, Wooo HOOOO! Seams are to the front, and when all the pieces are together, you sew twice around the border, 1.25 inches in, so when you cut, you get a nice shaggy border. You clip all the inner seams, and then wash, which makes it go all fuzzy. You don’t have to use flannel. I have seen this done with hopsack weave cloth, with equally satisfactory results. On the second quilt, a blue and white flannel, instead of applying stars, I varied block pieces, 1 strip 5″ x 8.5″, two pieces 5″ x 5″. I pieced the two 5×5’x, then attached them to the 5″ x 8.5″, so that the final blocks were 8.5 inches. I rotated blocks so they would all be different, sewed the blocks together and cut the seams and edges. I don’t think it took half a day, start to finish, and I love the results. These are SO easy! 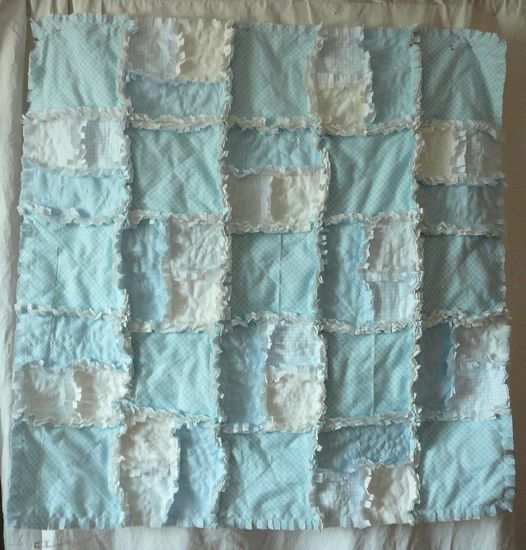 I’ve always loved the soft look the raggy edges give these quilts. I don’t imagine they last as long as quilts from more closely woven fabrics, but they have a great soft look. 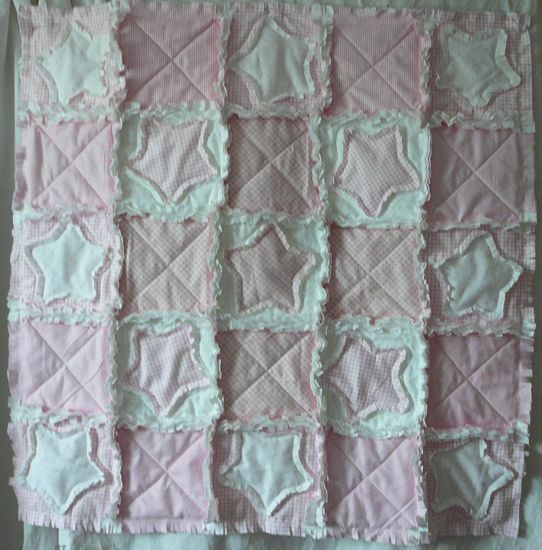 This entry was posted in 2011, Baby Quilt, Charity Quilts, Machine pieced, Machine quilting, Pensacola, Raw edge applique. What an interesting technique ! Thanks for sharing it and congratulations for those lovely quilts. Thanks for sharing the “how” with pictures! I feel like I can try this! I love making rag quilts like yours. They come together so quickly and are so cozy because of the flannel. 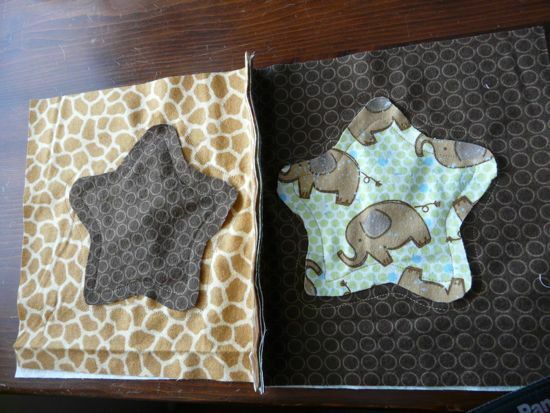 I had not tried putting the stars on the blocks, and love that idea. Thank you so much for showing your wonderful work.